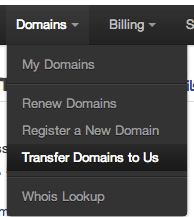 Customers can log into their client portal and use the ‘Domains’ menu to register, transfer, and renew domains. For the domain to be ‘live’ the nameservers for the domain will need to be set accordingly if you are going to host your own DNS, use our DNS cluster, or use a 3rd party service for DNS. Standard ‘.com’ domains start at $13/year.